One hundred and five players are listed on the latest Regional Seeding list which has been updated following the Regional Doubles Championship. Michael Rocks (Khandallah) maintains his top placing, with Christine Strichen (Wanganui East) taking over second place from Andrew Joe (Windy Hills). Explanation of the Seeding list. Horowhenua's Guy Fawkes Doubles Tournament was a happy, relaxed event. As a member of the winning team, Myles Cowper, said, in thanking the host club, it took him back to the real reasons for playing pétanque. In recent years the game had become too serious. But today he had had fun, enjoyed the company of the other blokes and hadn't felt afraid to open his mouth on the pistes. He had also been well fed – patting his tummy ruefully it is no doubt going to show up here. The tournament comprised six games of random draw played to 13 points and showed a very even standard of play with only one team achieving five wins and eight recording four wins. The lower five teams showed many hard-fought 13/12 losses. At the end of play Horowhenua members burnt their guy, an incredibly realistic creation made by Gale Eddie and Joyce Croft, with a flurry of rockets leaping up from the funeral pyre. The success of the tournament makes it likely that in future years the Saturday nearest 5 November, will become a regular men only club fixture. Andre Noel and Georgio Vakauta retained their National Doubles title by beating Maurice Belz and Ron Sandilands 13-2 in the Championship final. One interesting note, the top 8 qualifiers from Saturday all won through to the Trophy quarter-finals on Sunday afternoon. Note: The Shooting Competition was postponed until the National Triples. The Horowhenua team of Sandy MacDonald, Shirley MacDonald and Shirley Peard prevailed in the final of the Otaki Open Triples against the Wanganui East combination of Ken Heywood, Shirley Selwyn and Nico Toyne. The final results from the National Singles held at Kapiti (October 9/10) and won by Andre Noel are now available. 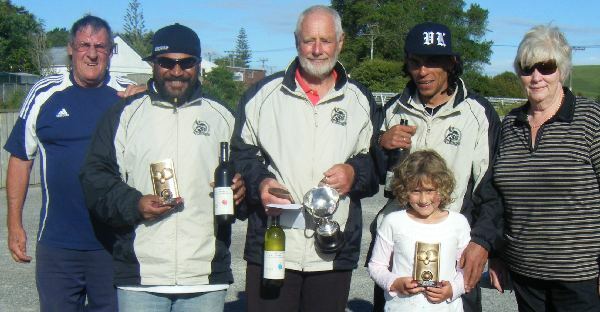 Ian Baker, Andre Noel and Georgio Vakauta won the fourth Wanganui East Open Triples. In the final they beat Morgan Choveaux, Michael Rocks and Nico Toyne. In an all Otaki club final, Barbara and Brian Frampton won the Regional Senior Doubles Championship by beating Ted Burr and Bob McCarthy. At the end of the first day's play, Wellington (27) have a six point lead over Southern Gold (21), followed by Canterbury (17) and Southern Maroon (7). There are eighteen points available in the Triples tomorrow. Wellington increased its points advantage over the rest of the field to retain the Southern Tri-Star it won last year in Wellington. Canterbury over-took Southern Gold to claim second place, but the big movers were Southern Maroon who closed the gap by winning four of the six Triples on offer. Morgan Choveaux was the star of the Wellington team going through the weekend undefeated. Park Avenue successfully defended the Jacques Cochonnet Trophy at home to neighbours Silverstream. Park Avenue's next defence will be away to Wanganui East. Triples: Barbara Nicholls/Graeme Pilcher/Monica Smiler vs. Brian Bradburn/Owen Davie/Barry Sarney 13-3, 10-13, 13-5.